That’s exactly, what solved this issue and the search result was sorted. Who would have thought? Thank you Dan and thank you Bob Cross. Kind of works as designed. To be able to sort a result set, you need an index for the column you want to sort with. Checking that property makes Domino build that index. Point in case: Open the view directly and click on a sortable column. You will see the URL syntax. Now change the URL to sort by a column that doesn’t have the property set. The Error you get is what triggers the Error 500 in XPages (which you could capture using an error page). A word of caution on FTIndex and views: There is but ONE FTIndex. So when you search in a view, you actually search in the DB and the result set is compared with the view collection. Depending on the view a Db.ftsearch and sorting in a Java collection might be faster. thank you for your comment. I guess, due to the fact that it isn’t apparent from the label of the property and also not from the hover-over help text that this option needs to be set on the view column, it just baffled me. I would have understood it, had the column we were using not been sorted. That would have made sense to me. 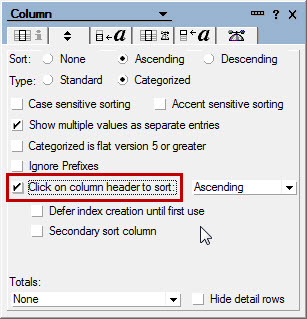 Checking the box beside an option that I see primarily as a UI setting (giving users the ability to change the initial sorting of the column by clicking on the header), in order for the sort column property to work, I would have never guessed it. the architecture is not what it seems. When you sort e.g. the first 3 columns (Like color, shape, size), Notes creates a composite index that has values line red-circle-big and blue-triangle-small. You can’t search for “small” since it reads from left to right. Checking the box makes Notes add a second index (e.g. 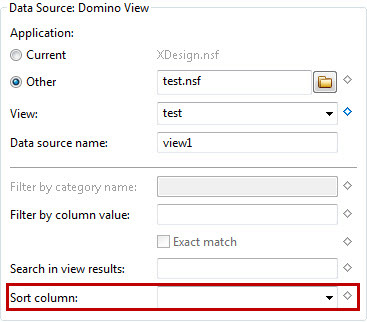 column size) then you can search for small, big etc. And yes, without that insight it is puzzling.